I have been writing Journey to His Past for less than a year. I have enjoyed sharing my husband's family with you. Kirk's ancestry has taken me to states and countries that I haven't researched with my family. As the new year approaches I thought I would share a few fun things with you. Timothy Francis Corcoran and Helen Smith Marriage License. I was ready to research. So was I. This is the number one search term. Interesting. Leyndyke James. This could be my father in law or brother in law. What would you like to know? St. Philipsland Netherlands Cemeteries. Kirk has ancestors from St. Philipsland, but I don't have an cemetery information available, yet. Sorry. Lena van den Bos. Yes, I have written about Lena van den Bos. She is Kirk's great, great grandmother. Contact me, please. I love making new family connections. Kirk's, Leyndyke or Luyendyk, heritage is 100% Dutch from his grandfather back. I find researching his ancestry fascinating. Today, Christmas Day in the United States, I celebrate his ancestry with a few holiday customs from The Netherlands. The eve of December 5th is the time that children look forward to in The Netherlands for it is the eve that Sinterklaas (St. Nicholas) visits, much like Christmas Eve is for American children. Don't confuse Sinterklaas and Santa Claus as they are not the same people in the Netherlands. The children are told that this is the day that Sinterklaas sails from his homeland in Spain. He travels with his servant, Black Peter, bringing gifts with him. Presents are put in a bag with a neighbor knocking on a door or window and leaving the bag there. The children aren't looking for a sleigh and reindeer as Sinterklaas travels on a grey horse going from rooftop to rooftop. These are just a few highlights of Sinterklaas. Peter at Peter's Blog does a much better job of explaining it. Scroll down the page to read the highlights or right click and translate his blog. I hope everyone has a Merry Christmas or as the Dutch would say Vrolijk Kerstmis. 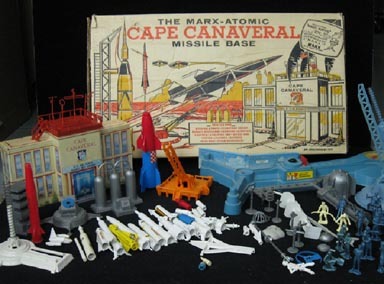 One of Kirk's all time favorite Christmas gifts as a child was Cape Canaveral Space Launch Play set. It was the Fort Apache of space. It was a set up of Cape Canaveral with rockets, trucks, and scientists. Kirk's dad, Jim, set it up as a replica of Cape Canaveral on a wooden board. Kirk and his brother, Jim, spent many hours launching rockets, sometimes at each other. Here is a colored picture of Cape Canaveral. It is that time of year when Fruit Cake is given as a gift. The Fruit Cake recipe below was found in Frances Dollaway's recipe book. I am not sure who Mrs. Rogers is, but Frances Dollaway had a son Roy, who married Agnes Rogers. There may be a connection there. There aren't any directions with this recipe, but if I was making it I would cream the sugar, molasses and shortening, add the eggs and buttermilk, add raisins, spices and soda. I wonder if this is all the ingredients or if she added flour. I don't know what would soak up the buttermilk. I think there must have been flour. What do you think? I like how it calls for spices. What spices? Cinnamon and cloves maybe. Source: Michigan, State of. "Death Records 1897-1920." Database. State of Michigan. Seeking Michigan. http://seekingmichigan.org 2009. The above record is the death certificate for Peter Luyendyk, Kirk's great great grandfather. I found it at seekingmichigan.org. The image is a little hard to read, but I was able to glean a lot of information from this record. Peter Luyendyk died 13 October 1903 in Gaines Township, Kent, Michigan. He was a farmer and a widow. 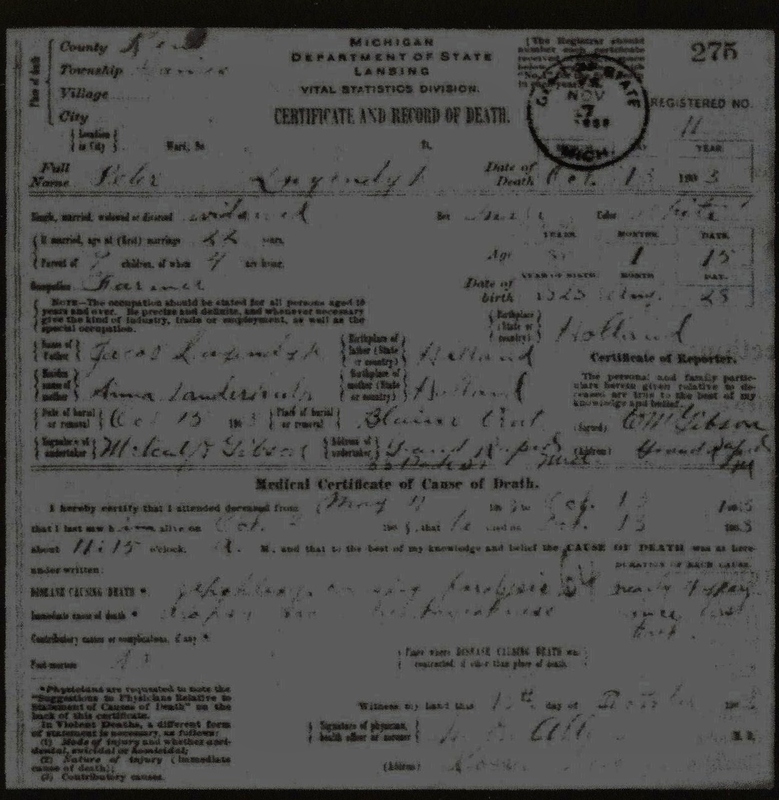 It lists his parents as Jacob Luyendyk and Anna Vanderhal?. Peter Luyendyk is buried in Blaine Cemetery, Gaines Township, Kent, Michigan. Unfortunately, there is no gravestone marking his burial place. Other research I have done shows that Pieter Luijendijk was born 28 August 1823 in Zuid-Beijerland to Jacob Luijendijk and Anna van der Burg. The birth date on the death certificate is wrong. Pieter Luijendijk married Jaapje Maasdam in Zuid-Beijerland, Zuid-Holland, Netherlands on 7 May 1847. Pieter and Jaapje immigrated to the United States in 1849, settling in Owasco, Cayuga, New York. Pieter and Jaapje moved to Michigan between 1860-1870. Jaapje preceded Pieter in death on 11 February 1900. Source: The Grand Rapids Herald, 11 April 1949, microfilm owned by Grand Rapids Public Library, Grand Rapids, Michigan. Mrs. Helen Corcoran, wife of Timothy F. Corcoran, passed away Sunday afternoon at her home, 1000 Lafayette Ave., SE. Besides her husband she is survived by two sons, Bertrand F. and Howard J., both of Grand Rapids; five grandchildren; two sisters, Mrs Joseph Pfaff and Mrs Lucy Smith, both of Chicago, Ill. The deceased was a member of the Macabees and the Claudian League. Funeral Mass will be sung Wednesday morning at 9 o'clock in St. Andrew's Cathedral. Mrs. Corcoran reposes at the Ronan Funeral Home were (sic) relatives and friends will recite the Rosary Tuesday evening at 8 o'clock. 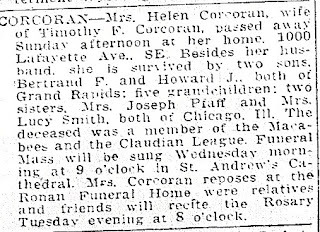 Helen Corcoran, nee Schmitt died 10 April 1949 in Grand Rapids, Kent, Michigan at the age of 66. She is buried in Restlawn Cemetery, Grand Rapids, Michigan. Sint Philipsland is located in the province of Zeeland in the Netherlands. It is the name of the village where many of Kirk's van den Bos ancestors lived. 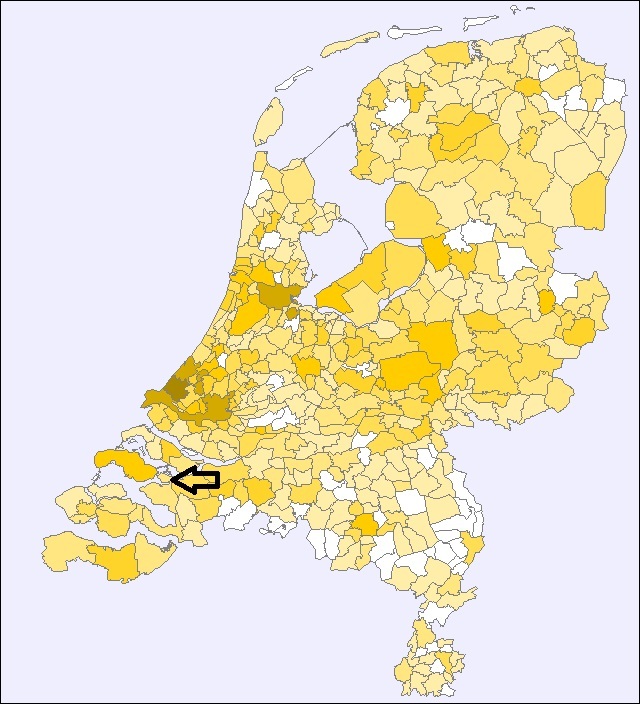 The village of Sint Philipsland was founded in 1645. Neeltje Cornelia van den Bos, Kirk's great grandmother was born in Sint Philipsland in 1877. I have traced the van den Bos family to the 1700's in Sint Philipsland. Other ancestor's surnames include Nelisse, Quist, van Oostende, Verwijs, de Zutter, and de Groene. These surnames are from Sint Philipsland, Netherlands, too. 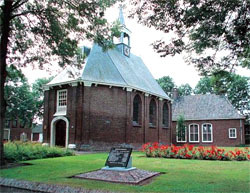 The Christian Reformed Church in Sint Philipsland, Netherlands was built in 1668. Kirk's ancestors were of the Christian Reformed faith. The above map of The Netherlands shows where the van den Bos name can be found today. 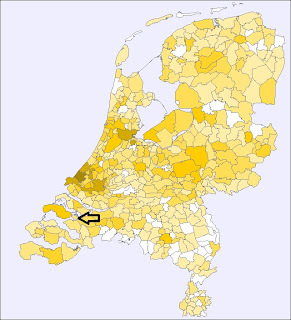 The darker the color the more people with the van den Bos name living in that area. 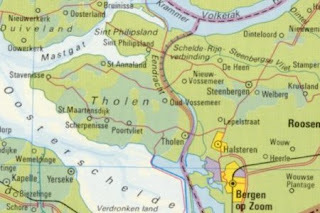 Sint Philipsland is to the left of the arrow. The above pictures are from St. Mary Cemetery in Vergennes Township, near Lowell, Michigan. These were the first cemetery photo's I ever took. I have learned a lot since then, like not to have my husband or the car in the picture. I need to return to the cemetery and retake the pictures. Joseph W. Denny died 22 September 1894 in Kent County, Michigan. His wife, Adelia DeGan Denny died 5 March 1905 in Grand Rapids, Kent, Michigan. Kirk's Grandfather, Bertrand Francis Corcoran was born 7 January 1903 in Chicago, Cook, Illinois to Timothy Corcoran and Helen Schmitt Corcoran. He lived most of his life in Grand Rapids, Michigan. He married Leona Dollaway in 1925. They had five children: Richard, Elizabeth, Helen, Nancy and John. Bertrand F. Corcoran died 21 July 1959 in Elk Rapids, Antrim, Michigan at the age of 56. He is buried in Woodlawn Cemetery, Grand Rapids, Michigan. 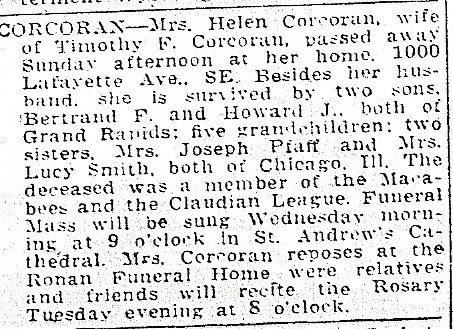 Kirk's maternal grandparent's, Bertrand Francis Corcoran and Leona Adelia Dollaway were married 3 June 1925 at St. Andrew's Catholic Church in Grand Rapids, Michigan. Their marriage record can be found at Kent County Clerk's Office in Grand Rapids, Michigan Book 22-Page Number 81. It is also available in Michigan Marriages 1868-1925 through Family Search website. This is a transcription of the information found at Family Search. Place of Marriage: Grd Rapids, Kent Co. M.